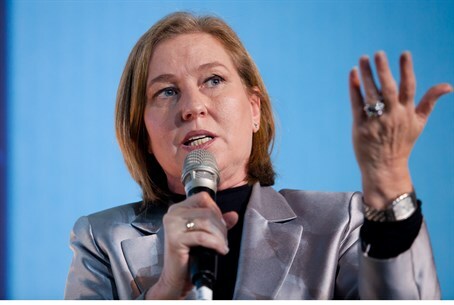 MK Tzipi Livni (Zionist Union/Labor) on Thursday praised the performance of IDF soldiers during the Second Lebanon War. Livni was Foreign Minister during the war, under the leadership of former Prime Minister Ehud Olmert. Both were members of Kadima, the party formed two years earlier when Ariel Sharon broke away from the Likud. Kadima is no more, and Livni is number two on the Zionist Union/Labor list. Speaking at the event Thursday, Livni said that now, like then, Israelis were still targets for terrorists. Malachi Rosenfeld, the Israeli who died Tuesday of wounds sustained in a drive-by shooting by Arabs Monday night, was one such victim. Rosenfeld was shot near Shilo – an area of Binyamin that Livni would readily surrender to the Palestinian Authority if she had the opportunity to do so. “I am a member of the Opposition and it is true that we have a difference of opinion on this. I never tried to hide this. However, we are all united as a people, and there is no difference between any of us when it comes to fighting terror, whether it is Hezbollah or Hamas,” she said. “As we speak and remember the soldiers who sacrificed themselves, the UN Human Rights Commission is meeting in Geneva to declare immorally that Israel is guilty of war crimes in Operation Protective Edge,” said Livni. “We will never accept an equivalence between IDF troops and terrorists. We know with what values our soldiers go out to the battlefield. Our values are rooted deep in their hearts, and they do not remove those values when they put on uniforms, but act according to them even when they are in the midst of the enemy.